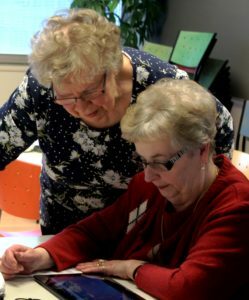 Our Finnish member Oulu Deaconess Institute (ODL) has recently run a project on mobile technologies as support in group activities for elderly people. Together with the Department of Physical Education of the University of Oulu, ODL has tested a mobile application developed for the mental wellbeing in Friends and Family Caregivers groups. Seven elderly people and two staff members tried the app as part of group activities as well as on their own in the free-time. The study main goal was to find out whether mobile applications can be suitable for anti-ageing activities. According to the results, reported in a scientific paper, the technology used had a significant impact on the acceptability and adoption of the mobile application among the elderly people involved. The mere learning of the device initially required time for the users (up to 40 hours) but the mental wellness exercises included in the mobile app were found to be beneficial and suitable for group activities. The project also showed that observing the specific needs of a target group in designing a a mobile application can help to integrate technology into part-time group activities. To know more about this project, please read the news on ODL website.